Drones were once thought to be used only by the military and considered top secret. They have now have gone mainstream and are used across all sectors, from small business to large industries, public and private. Drone technology is progressing at a great rate, and a huge part of that growth is due to the diverse fields in which drones are used. With the increase in popularity comes the growing number of positions available for properly trained and skilled drone pilots. The future is bright for drones. The opportunities for businesses to develop further uses for this updated technology is enormous. Let’s look at a few of the top industries that are using drones now. Drone technology in farming and agriculture represents a huge opportunity. Drones can assist farmers in many ways. Drones have been changing the way movies are made, and how pictures are taken. Whether you are a photographer taking wedding pictures or a filmmaker making your next documentary, drones are allowing us to see visual media like never before. With the regulations for production companies constantly changing, we can expect to see drones used in filmmaking more and more. Drones are becoming the new perfect complement to any professional photographer. They are increasingly used to capture special events. Photographers – especially those who serve at special events cannot afford to be left behind and will need to adapt to this new technology. 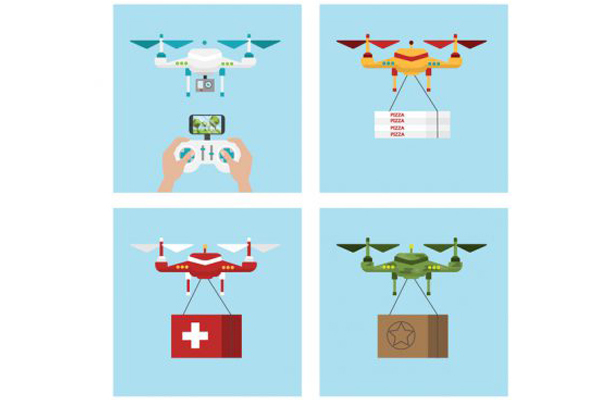 Drones are providing the marketing sector with the ability to develop rich content. As the demand for video content increases, agencies are under pressure to provide more compelling and productive media marketing. Drone technology allows marketing agencies to showcase even the smallest of businesses with a fresh approach. Progressive news media are also seeing the massive advantage of drones. Drones can capture news and events as they unfold, without the risks reporters could face on the ground. Where can we expect to see drones in the future? Drones are here to stay, and as more businesses take advantage of this technology, we may find ourselves in a world where drones are as common as smartphones. This entry was posted in Drones and tagged Drones in business.